As many as 12,000 students in metro Atlanta are taking part in a program called Inner Explorer, which involves daily audio sessions that focus on their emotional development. 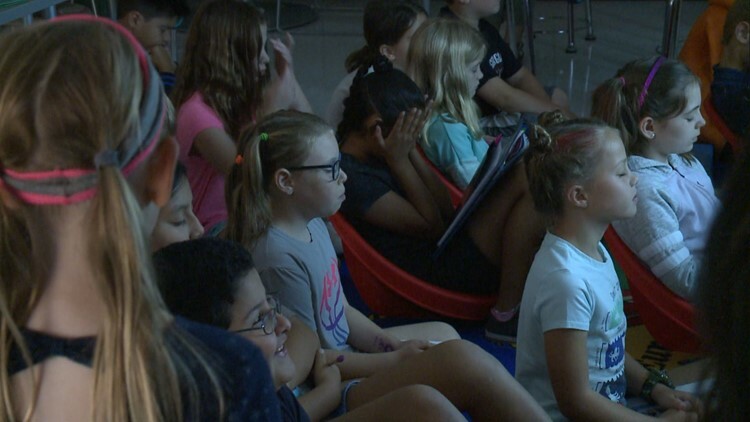 Right after recess, fifth-grade students at Northwood Elementary School in Roswell gather around the front of the classroom, while the lights go off and a soothing voice fills the air. "Breathe in, breathe out," they hear from a program playing on the smart board. The program is called Inner Explorer. It's a series of daily 5-10 minute audio sessions that focus on students' emotional development. "They tell us to close our eyes and do the shark fin, which is where you pull your hand down your face, cover your heart and say, 'I am wise. I can make responsible choices,'" explained student Taylor Lasoff. Students call the sessions "mindfulness practice," and they take it seriously. Teachers are sold on the idea and practice with their students. "There were two students yesterday teetering back and forth about something, and one of them said, 'We should calm down and talk about this like we do in mindfulness.' And I was like, what?" recalls Karen Sotola, a teacher for 17 years. According to three research studies by Inner Explorer, involving more than 900 students from diverse socio-economic backgrounds, teachers reported a 43 percent reduction in their students’ stress levels and a 50 percent reduction in disciplinary actions. Fifth-grader Frannie Asher remembers her lessons when she's at home. "I kind of take some of it to help calm myself down when I'm doing homework and I get frustrated," Frannie told 11Alive's Jennifer Leslie. For parents, it was an easy sell. "Several parents have told me this is the best thing you've done because parents do feel their children's mental health is more important than anything else," explained Northwood Principal Ritu Ahuga. Taylor, who started Inner Explorer as a fourth-grader, starts her day by writing in her mindfulness journal. "I feel like the rest of my day is hectic, bustling around doing work, trying to find this, trying to find that. Doing mindfulness, I get to calm down and relax and take out all the stress from the day," she said. The program is free for two years through a sponsorship by LG Electronics USA. It's part of a new company initiative called “Life’s Good: Experience Happiness." Already, about 12,000 students in Roswell, Johns Creek and Griffin are taking part in the program to reduce stress and anxiety levels and create "sustainable feelings of happiness." Webb Bridge Middle School, Johns Creek High School and Griffin County Schools are also involved. Life’s Good: Experience Happiness is expanding to 27 more metro Atlanta schools this year, and another 220 schools across the country. The “Experience Happiness” platform is designed for students of all ages. It includes other programs, like the University of California Berkeley’s Greater Good Science Center, Discovery Education and Project Happiness. The goal is to reach 5.5 million students over the course of five years with the six happiness skills: mindfulness, human connection, positive outlook, purpose, generosity and gratitude. More information is available on the LG USA website.